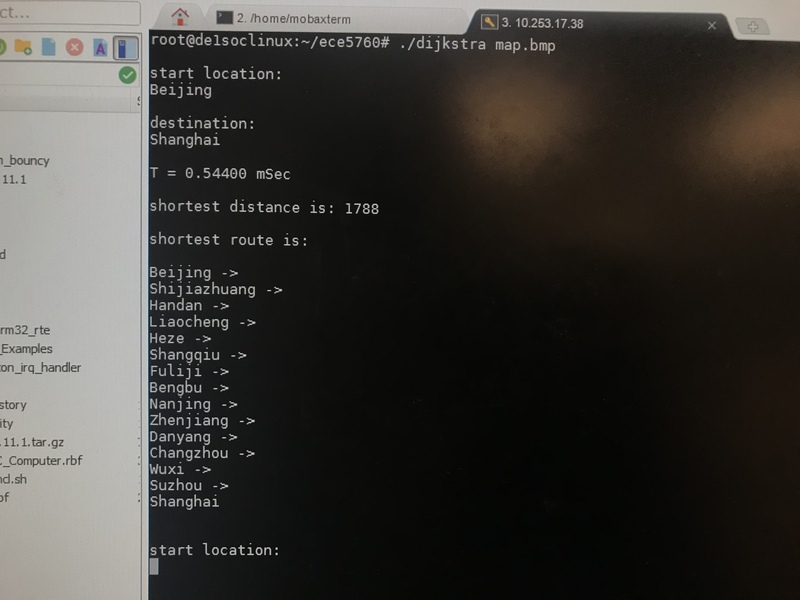 In this project, we implemented the Dijkstra algorithm on FPGA to find the shortest distance and route between two stations among the railway network of China. The program contains 304 Chinese primary railway stations that are spreaded all over China. When running the program, the whole map with all the railway stations and connectivities among them are firstly displayed on VGA. Then the user could choose any two stations as the start location and the destination by typing the names of the two stations or clicking the mouse at the corresponding points on the screen. 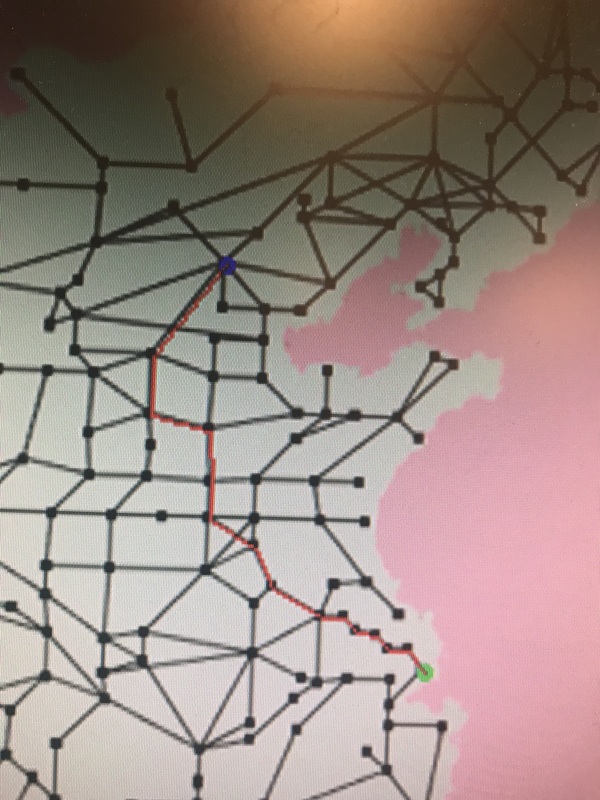 The program would soon return the minimum distance and route between them according to Dijkstra’s algorithm and display the detailed routes on VGA. The overall distance would be computed and displayed. Every station along the routes would also be included. This program could also be implemented in HPS side only so that the speed difference could be demonstrated when comparing to that running with FPGA and HPS. As a result, the FPGA/HPS computation speed of this program is 10 times faster than that by HPS only. The project was firstly inspired by one of the assignments from CS 2110 “OO Programming and Data Structures”. This assignment applies Dijkstra's shortest path algorithm to calculate the shortest path between two planets in a 2D-mapped universe. With the suggestions from Professor Bruce Land, the body of the map was changed to a real-world road map for more practical use. 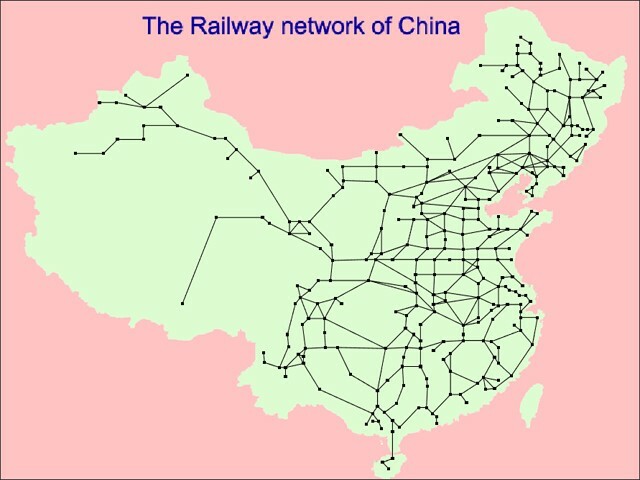 So, we choose the railway map of China to be dealt with in our project as Figure 1 shows. 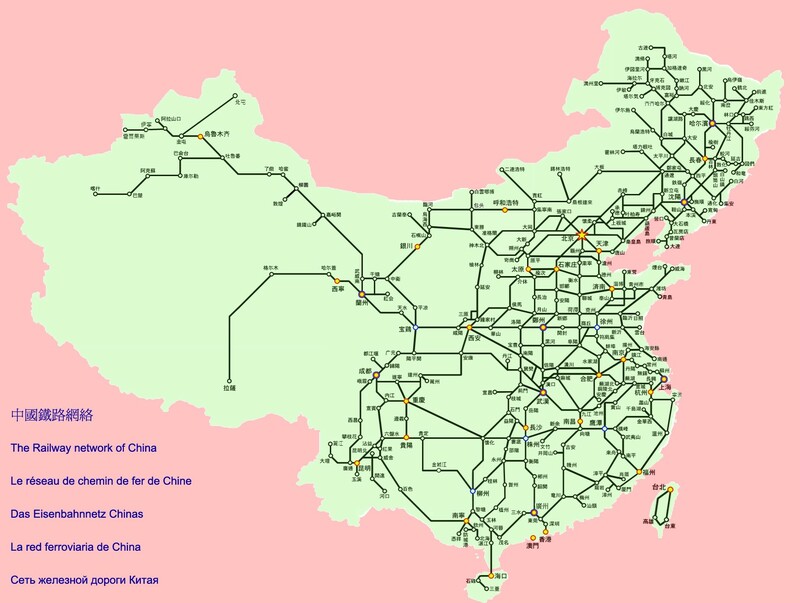 The reason is that the railway map of China contains 304 stations which is not as complicated as the roadway map in a city but enough to show the difference of the calculation speed between FPGA and HPS only. Moreover, the railway stations are easy to locate and the distance between two stations is easy to find. In terms of this project, the number inside the circle in Figure 2 represents the railway station. The lines connecting two circles represent the railways and the number aside the lines is the distance of that railway. For example, to get from station 1 to station 4, there are multiple choices. The dijkstra’s algorithm which is explained below with tables will help us find the shortest distance from station 1 to station 4. At this stage, row 1 represents the minimum distance between node 1 and each of the other nodes. The function performed by this program is similar as using Google Map or Baidu map searching in the Transit mode. 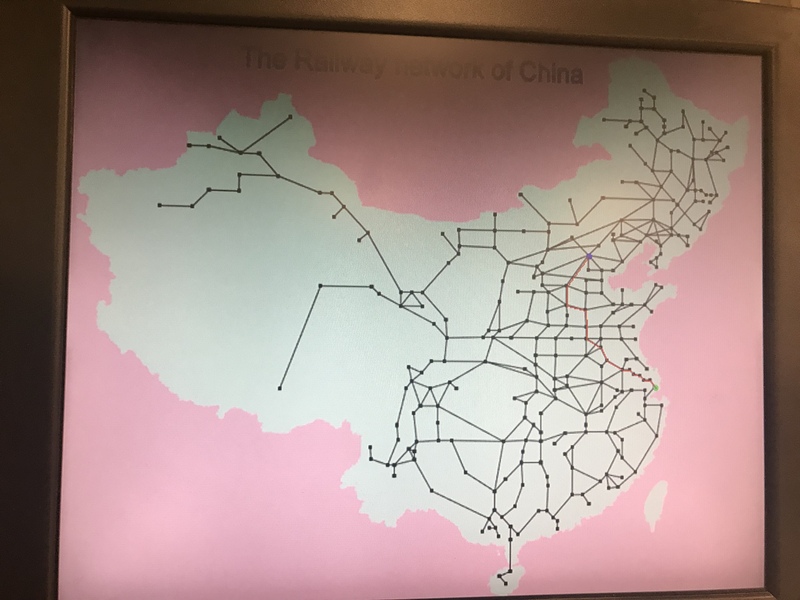 The Chinese railway map as Figure 1 shows was firstly modified by MATLAB in order to be displayed in VGA. The modified picture is shown below. We convert this picture from .jpg to .bmp then we can read its pixel information easily using C code. We have a function in our code called map_display to be in charge of displaying this map. 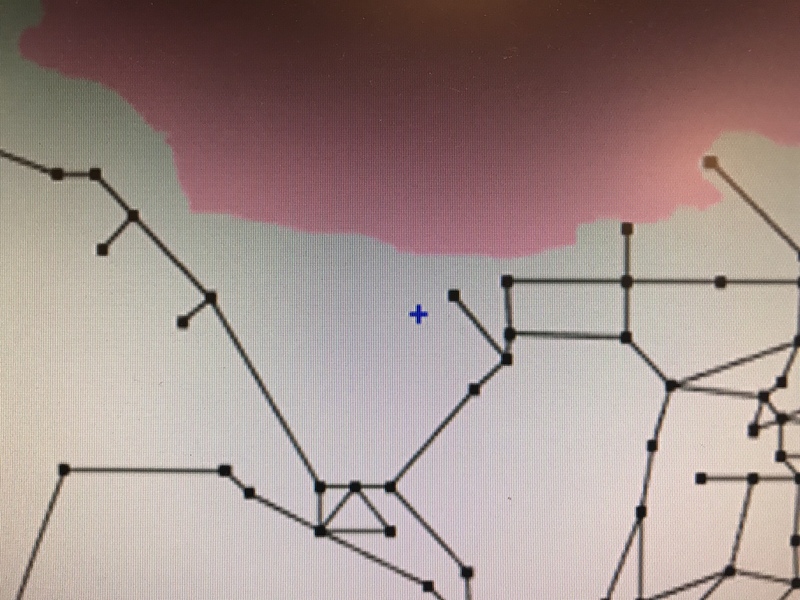 The map_display function will read this .bmp file in sequence. After reading the header information like the height and width of this picture, the B, G, R value of each pixel will be read. We incorporate the separate RGB value into the 16-bit format then we can use the VGA_pixel function provided by Bruce to draw this picture on VGA screen. The relevant code is shown below. The Dijkstra function is the core function in our code. Once the user selects the start location, the start location will be transmitted to this function as the parameter “start”. The parameter “max” indicates the total number of stations in our map, the 304. 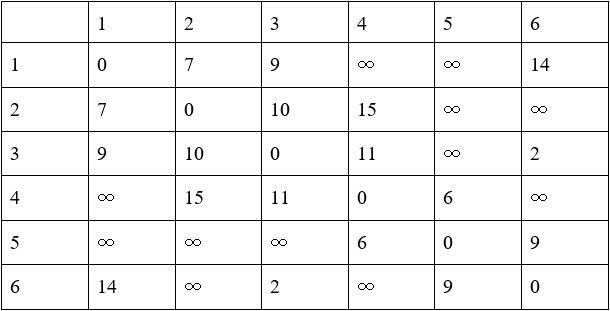 The parameter “infinity” is a huge number which indicates there’s no connection between two stations. 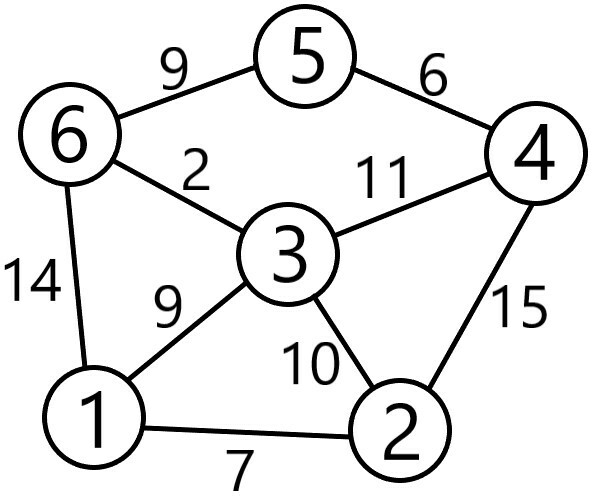 There are three important arrays in the Dijkstra function: distance, shortest, and neighbor. The distance array stores the distance from start location to any other station which will be updated 303 times to make each cell the shortest one. The shortest array indicates whether the corresponding distance is the shortest. If one cell of the shortest array is true, then the corresponding distance won’t be updated. The neighbor array is helpful later to find the shortest route from the start location to the destination. It stores the station from which the corresponding distance will be updated. In the first “for loop” in our code, we will initialize the value of the three arrays. The second “for loop” will loop 303 times to get the shortest distance from start location to any other station. In the second “for loop”, there are two sub “for loop”s. 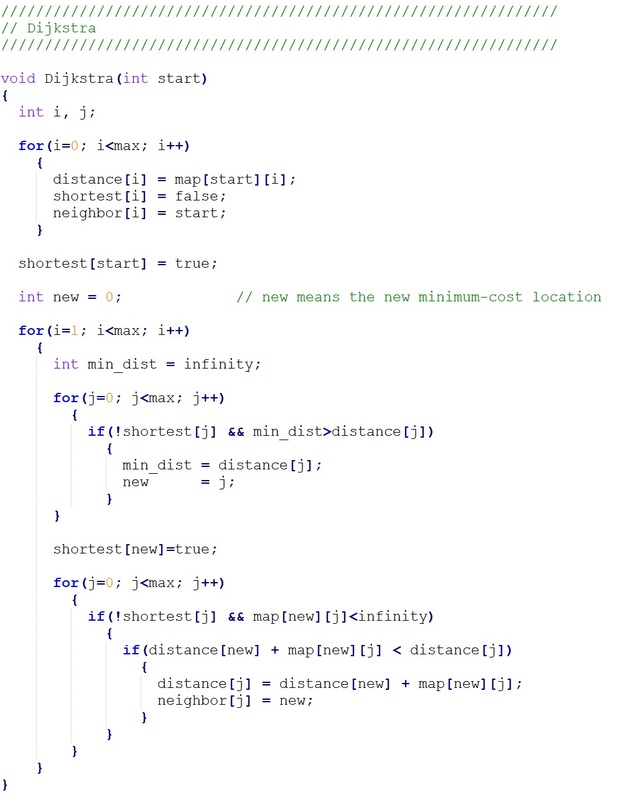 In the first sub “for loop”, the minimum distance among all the unfixed distance will be found and in the second sub “for loop” the distance and neighbor array will be updated. The min_path function is a recursive function which helps us display the shortest route information from start location to the destination. Once the Dijkstra function is done, we get a neighbor array with useful information. In each of its cell, there stores the station from which the corresponding distance has been updated to the shortest one. We transmitted our selected start location and destination to the min_path function as the parameter start and dest. And then use those two parameter and the neighbor array to display the shortest route. After the implementation of Dijkstra algorithm in C code, we will implement it on FPGA. First, we need to implement 304*304 storage cell on FPGA board to store the map information as Table 1 shows. As 304*304 is a big number, we will implement these storage cells with M10K blocks. We choose to implement 304 M10K block in our design, each of which has 304 storage cells, representing a column in Table 1. Then we set a variable “counter” to be used as the address of all the memory blocks. In this way, we can read or write 304 storage cells, all in the same row as Table 1 shows, in the same cycle. Here we need to notice that the M10K block takes two cycles for read. We need to follow a certain style to implement the M10K block and use generate to implement it by 304 times. The relevant code is shown below. For the three important arrays mentioned above in the Program details, we just use register files to implement them for each of them just has 304 storage cells. The implementation of Dijkstra function on FPGA is based on the FSM design structure. The state transition always block is shown below. In the state map_init, we will initialize the map memory we’ve just implemented, which takes 304 cycles to move to the next state. 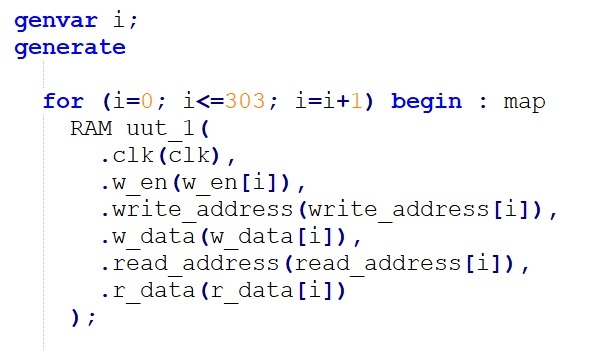 In the C code, this step takes 304*304 loops to initialize the map by reading a data from a .txt file in each loop which will take a long time. Therefore, we won’t include this time period for initialization in our later comparison between FPGA and HPS only. Otherwise we may see that our FPGA implementation is 70 times faster than HPS which is just an illusion. In the state dsn_init, we will initialize the distance registerfile, shortest registerfile and the neighbor registerfile which is corresponding to the distance array, shortest array and the neighbor array in the C code, respectively. Naturally, after the dsn_init state we want to move forward to the state min_cost in which we will find the minimum distance among all the unfixed distance like what we wrote in C code. 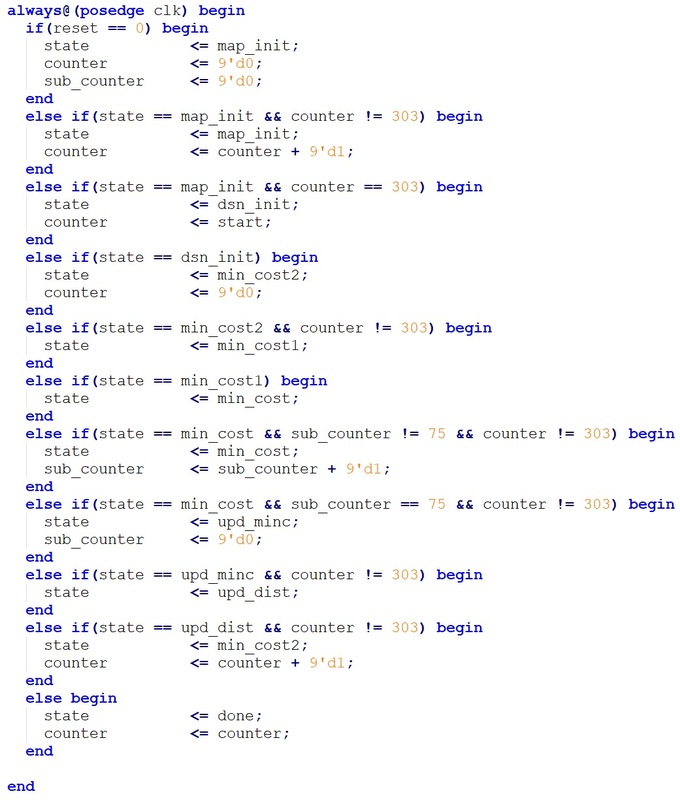 However, as M10K block takes two cycle to read, we set two more state min_cost2, min_cost1 as an interval before we move into min_cost to wait the distance registerfile, shortest registerfile and the neighbor registerfile complete their initialization. 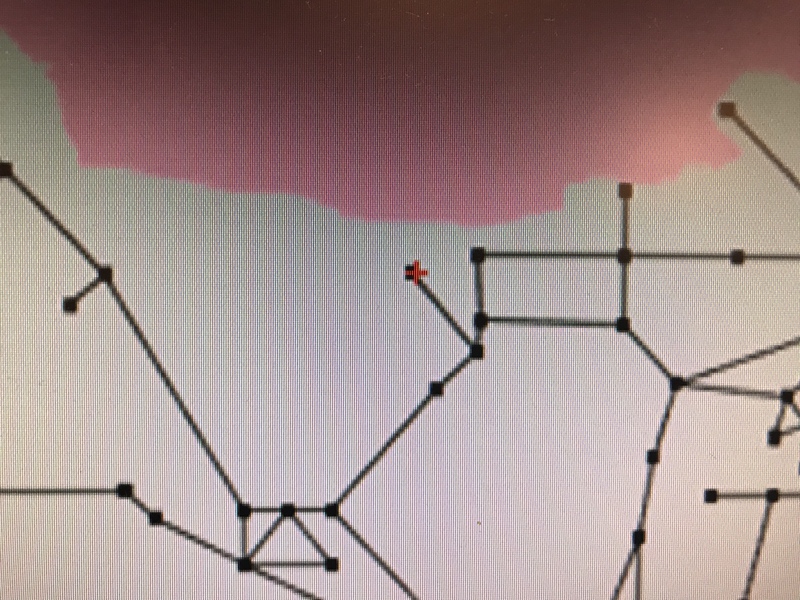 The state min_cost will take 76 cycles because as we discussed in the High level design, we implemented four 2-input comparator in our design so we need 76 cycles to get the minimum distance out of 304 distance. In C code this step takes 304 loops to get the minimum distance. Then we move to the state upd_minc in which we will update the shortest array. Next, we will move to the state upd_dist in which we will update the distance registerfile and the neighbor registerfile in one cycle. Our 304 M10k block each representing a column in Table 1 allows us to achieve such a quick update. In C code, this step takes 304 loops, updating a storage cell in distance array and neighbor array in each loop. Then we will move back to the state min_cost2 until we repeat such flow by 303 times, which is corresponding to the second loop in C code. We can’t decrease the iteration times here and once the flow iterates 303 times, we will move to the state done. Once we get to the state done, we need to transmit the data in distance registerfile and neighbor registerfile back to the HPS. 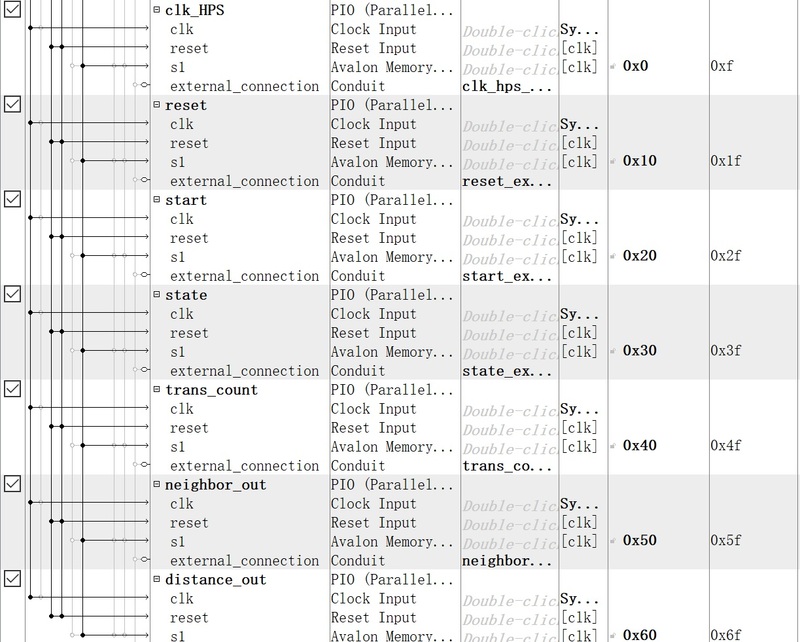 Therefore, we need to add some parallel I/O port in Qsys to build the connection between FPGA and HPS. The added Parallel I/O ports are shown above. clk_HPS is the clock signal generated by HPS to drive the circuit on FPGA. reset is also generated by HPS to control the reset time on FPGA. start is an output of HPS to transmit the start location to FPGA. state is an input of HPS which tells HPS when the FPGA moves to the state done. neighbor_out and distance out are input of HPS which transmit the data in distance registerfile and neighbor registerfile to HPS serially. trans_count will count 304 times to make the distance_out and neighbot_out complete their transmission. We start our C code design from the Figure 1, the very simple map. After we make sure that we can correctly implement that, we try some other self-made simple map to verify the correctness. Then we extend our map to 304 locations and implement it in C code. We run the code on HPS side and get the calculation time approximately 5ms. When we move to the implementation on FPGA, we first test it using Modelsim. When we set the clock period to 20ns (clock frequency = 50 Mhz) which is the same as the clock frequency we use on FPGA board, we find that it takes roughly 5000 us to complete the process. 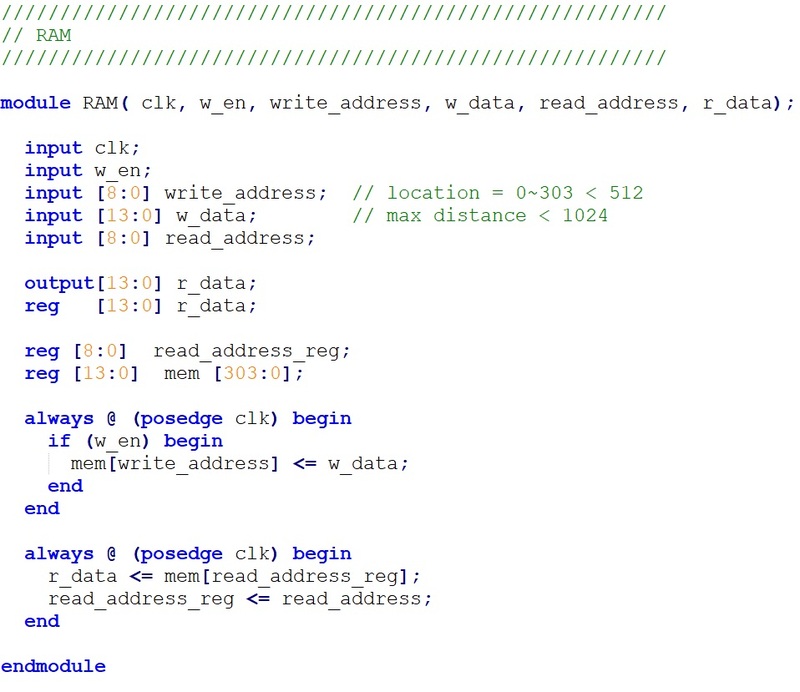 And we write list of the data of distance registerfile and neighbor register file out, comparing it with the result of C code to verify the correctness of our Verilog code. Then we use Quartus to program our code on FPGA. We can get the exactly run time displayed on console window which is almost the same as our expectation, 0.5ms. Also, we can get same shortest distance and shortest route by FPGA and HPS only. 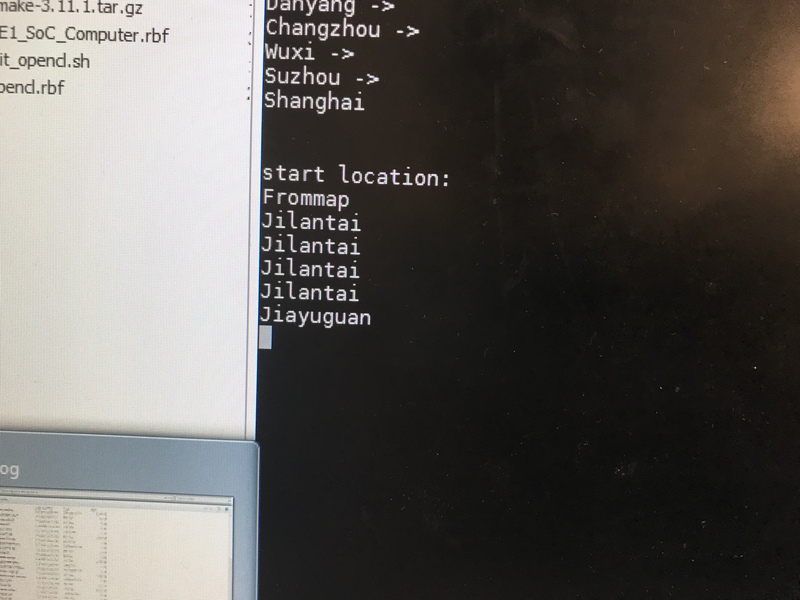 To make our map system more friendly to someone who doesn't know Chinese location well, we can use mouse to choose the start location and destination on the VGA screen besides typing their names. The following pictures shows the process that we use mouse to make the selection. Figure 16. Selected station name will be shown. Figure 17. Enter button to verify selection. 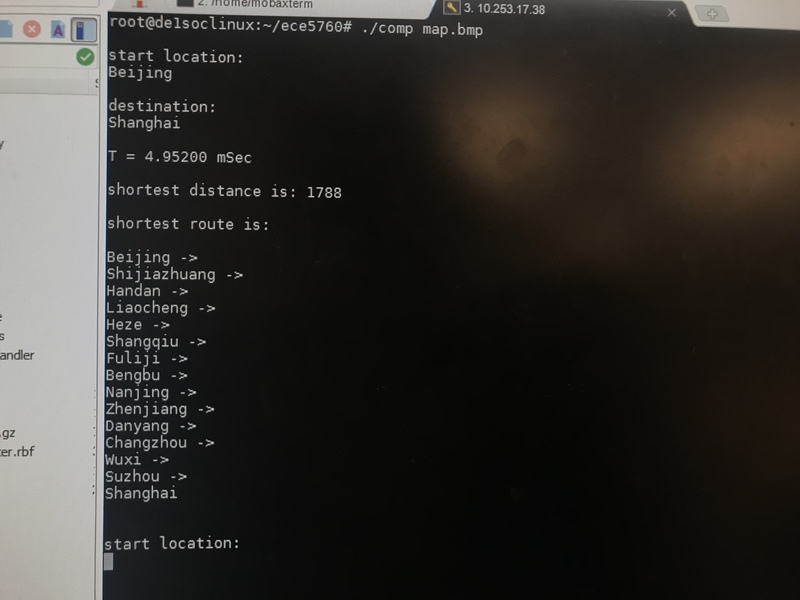 In this project, we successfully implemented the Dijkstra algorithm both on FPGA and HPS to find the shortest distance and route between two stations among the railway network of China. We want to take use of the advantage of parallel data processing of the FPGA to accelerate the Dijkstra algorithm and we get an ideal result that the FPGA computation speed of this program is 10 times faster than that by HPS only. The display on VGA screen also meets our expectation. In the future, we can try some other algorithm applicable for searching shortest path which may require less storage and may be more suitable for parallel computing. Also, we can try to make our system more friendly to users. The group approves the video for inclusion on the course youtube channel. Click Video is here! to go to youtube video. Richards, Hamilton. "Edsger Wybe Dijkstra". A.M. Turing Award. Association for Computing Machinery. Retrieved October 16, 2017. Land, Bruce. “Univ Computer Graphics.” DE1-SoC: University Computer. Graphics, Audio, IPC. Cornell ece5760.